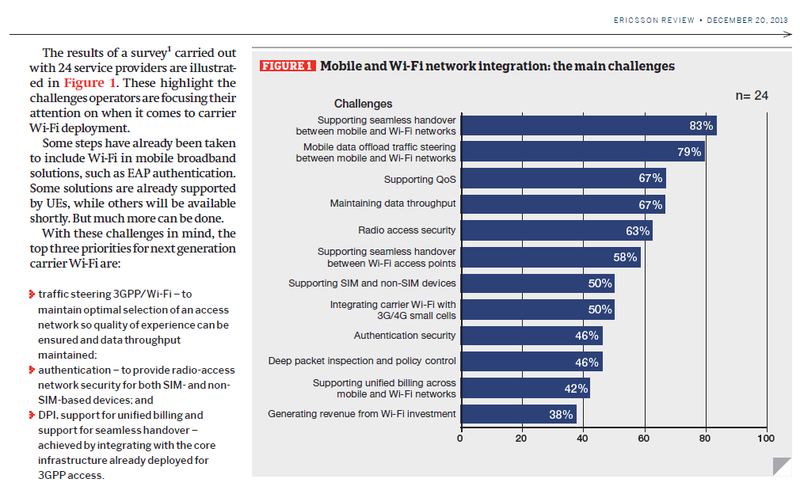 Ericsson published a paper in their journal last month about how the next generation of Wi-Fi and its integration in the 3GPP core would help moving between Wi-Fi networks and the Cellular network seamlessly. People who read the 3G4G blog regularly would know that this is done using the Access Network Discovery and Selection Function (ANDSF). For details see here. Another post from the 3G4G blog explains the key challenges in moving between the Cellular and Wi-Fi technology. If not done properly, the QoE can be really off putting for the end user. DPI, support for unified billing and support for seamless handover – achieved by integrating with the core infrastructure already deployed for 3GPP access. 3GPP has been working extensively in the new releases to come up with new features that would solve some of the issues and limitations that is affecting widespread deployment of carrier Wi-Fi and seamless roaming between the different technologies. Sometime back I provided the list of the features that are being released as part of different 3GPP releases, available here.